Commonwealth expenditure on CRA ($4,438.8m) and NHHA (2003.8m) totalled $6,442.6m. Commonwealth expenditure under the NHHA in 2017-18 increased by $280.9 (16.3%) almost of all of which is explained by an additional $225.4m on Remote Indigenous housing. State and territory outlays totalled $5,595.7m. State expenditure on social housing per capita varied from $82.94 in Victoria to $638.97 in the NT. Victoria’s per capita spend is now less than half the national average of $166.93 per head of population. State and territory governments reported transferring (management of) $1,375.4m of public housing stock to the community housing sector in 2017-18. Most of this was in SA where the transferred stock was valued at $1,079.1m. Over the past decade, the number of social housing dwellings has increased by 29,930 or 7.4% – well below population growth of 11% over the same period. Public housing and state owned and managed Indigenous housing dwelling stock has fallen by 20,233 over the decade, to 330,917 in 2018. 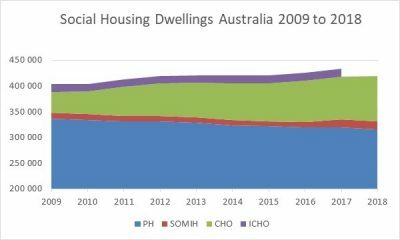 At the same time as public housing has retracted, the community housing portfolio, including Indigenous community housing, has expanded by 44,348 dwellings to 103,849. Community housing now represents 23.9% of all social housing dwellings nationally. 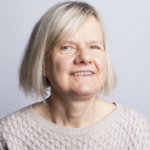 The latest Report on Government Services 2019 confirms another year of steady growth for the community housing sector. Dwellings held by Indigenous community housing organisations rose by 3.7% (569 dwellings) to 16,030 in June 2018. Increases in NSW (366), NT (322) Qld (78) and SA (43) were offset by loss of dwellings in Victoria (219) and WA (21). Waiting list pressure on community housing is growing, up from 38,776 on the waiting list in 2017 to 43,844 in June 2018. Even discounting the increase in the waiting list in SA following transfer of public housing stock, the national wait list for community housing grew by 7.8% (3,007 extra). The number of new applicants on the wait list for community housing who were in greatest need sky-rocketed by 46% between 2017 (17,315) to 2018 (25,265). The wait list for public housing fell from 142,490 in 2017 to 140, 578 in 2018. New applicants in greatest need on the public housing waitlist grew by 20% (up 7,798), driven mainly by a 6,933 (58%) increase in public housing applicants in greatest need in Victoria. The number of CRA receipts fell by 32,245 between 2017 and 2018 to 1.311m people. Falls were reported in all jurisdictions except WA and SA (which had marginal increase of 0.2%). CRA outlays fell by $100m to $4,438.8m. Even after CRA, 40.3% of recipients paid more than 30% of their income in rent and 12.5% paid more than half their income in rent in June 2018. Almost one in four CRA recipients under the age of 25 paid more than half their income in rent. Data on ICHO numbers is not included in the 2019 ROGS.